Once you have cancer, you'll also have an oncologist – a cancer doctor. You may very well be seeing this doctor for the rest of your life. How do you know if this doctor is your perfect match – or half of a relationship destined to fail? 1. You feel comfortable talking about your deepest feelings. Cancer isn't just a physical disease; it's very emotional. As you go through treatment, making life-or-death decisions all along the way, it's critical to be able to say what's in your heart. The best decisions are ones made with your doctor; and s/he can only help you make those decisions if s/he knows how you really, REALLY feel. 2. You don't feel rushed during office visits. Doctors these days are under great pressure to see a certain number of patients every day, and this inevitably leads to tightly scheduled appointments. It's your job to be as efficient with your 20 minutes as possible; come prepared with a list of questions or discussion topics. It's the oncologist's job to handle this tight timeframe with as much grace as possible; and this means appearing calm, knowing how to facilitate a conversation, and checking in with you at the end to make sure your most important issues were covered. 3. S/he's receptive to talking about what you've Googled. Many doctors will become impatient answering questions about "that breast cancer vaccine study" you read about online. The good ones will validate your interest; know enough about the study to respond briefly; and be able to explain why or why it's not a good idea. You need to be very careful about what Googled information you bring to the table; your oncologist doesn't have time to talk about the avocado pit cure discovered in an ancient Mayan tomb. However, if s/he's not interested in the new chemo drug presented at this year's San Antonio Breast Cancer Symposium, think about finding another doctor. 4. S/he looks at you as well as at the computer. Electronic medical record-keeping means many doctors spend way too much time squinting at the computer, rather than looking at you. It's a given your doctor will need to take notes as you speak; but make sure s/he glances up regularly, especially when you ask a question. Dividing attention between you and the keyboard can be counter-productive. 5. S/he makes eye contact, smiles, and exudes genuine warmth. Some patients feel bedside manner is less important than medical knowledge and skill. But at the end of the day, why not try for both? A cold clinician may know everything about breast cancer, but might be unable to build the confidence and trust that are hallmarks of the best cancer treatment. If you don't trust or like your oncologist, you're less likely to follow your treatment regimen; and also less likely to reveal critical information about yourself that could impact treatment. A smile and a pat on the shoulder do wonders for the woman fearing she'll never live to see her kids grow up. 6. You're offered not just treatments, but reasons for them. Does your oncologist tell you that s/he's recommending a medication – and here's why? Does she explain to you the risk of recurrence if you're treated with certain cancer drugs (with their potential side effects) vs. just telling you you're going to take it for the next 10 years? Many women fail to successfully complete treatment regimens ordered by their doctor. You're more likely to do so if you know that a drug that's making your bones ache is also beefing up your immune system for the next chemo treatment. 7. You discuss non-cancer parts of your life during your visits. A great oncologist will know you as more than a name and face; s/he'll remember that your son plays on the high school soccer team, and that you recently changed jobs. On the flip side, you may know that your doctor recently had a baby, or her husband is the middle school science teacher. Building comfort and trust is a huge part of your mutual relationship. And sharing (briefly!) some details of your lives with one another – as you would with a friend – is key to building that relationship. 8. S/he's prepared for your visit. The short window of your actual office visit should be used effectively. An oncologist that spends 5 to 10 minutes of your 20-minute visit flipping through computer screens looking for information isn't sufficiently prepared. The occasional bout of unpreparedness might not be his fault; but chronic confusion might be a signal for you to look for a different doctor. 9. S/he remembers and takes into account your other health conditions. It's OK that your oncologist doesn't know you've been diagnosed with osteopenia – at first. But after a couple of visits, your personal medical history – as it pertains to breast cancer treatment – shouldn't be something that takes a reminder. It's your job to make sure your oncologist knows anything about your health that might be pertinent to breast cancer; it's her job to make sure that the information is in your patient notes, and referred to when appropriate. 10. S/he's happy to take a selfie with you. This is Gary Schwartz, who's been my oncologist for the past 14 years. 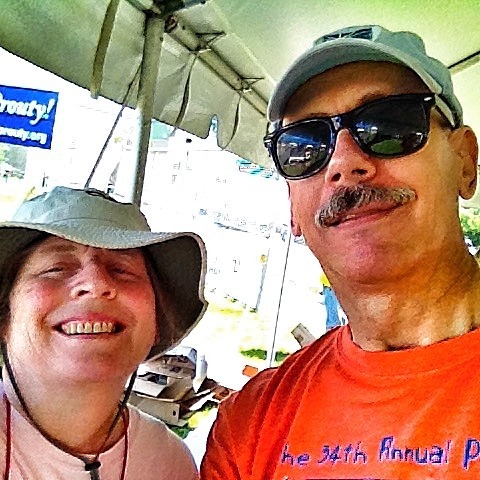 I nabbed him while he was working the food tent (passing out cheese for the cheeseburgers) during our annual cancer center fundraiser. Thanks, Gary; you saved my life, and I'm happy I still get to see you for a "tune-up" regularly!